Once you’ve built a daily meditation habit, you can feel “off” if you don’t have a chance to meditate. many meditators try their best not to take a day off from their practice, not even if they’re traveling. Keeping the habit up can be difficult with long flights, changing time zones, and changing locals. But sometimes meditation is even more essential while you’re traveling, helping to keep your stress levels down and keep you in touch with your breath. Many people struggle to meditate without props or cushions to keep them comfortable. Luckily there are travel meditation cushions and mats available that are compact, easy to pack in a suitcase, and still designed to add comfort to your practice. This article looks at travel cushions and pillows, as well as a few travel meditation mats and zabutons available. If you’re someone who likes to travel light or weight and space are at a premium in your suitcase, the Mobile Meditator may be exactly what you’re looking for. This is a crescent-shaped inflatable meditation cushion perfect for a sitting meditation. Inflatable cushions are great because you can easily adjust the height and firmness by how much you inflate them. What sets the Mobile Meditator apart from other inflatable meditation cushions is it had three separate inflatable air chambers. This allows you to more easily customize the firmness and height for different parts of your body: the center chamber changes spine support and pelvic tilt, the side chambers control hip and thigh support. This travel cushion has a lot of great reviews on Amazon, and some users say the customizability of the cushion makes it their favorite to use at home as well. In addition to using it for meditating, some travelers have also inflated it to use as a pillow on their flight. Vertical Vitality has introduced another inflatable meditation cushion perfect for your practice on the go. Another crescent shape option, this cushion is easily inflated by mouth or with a pump. You can adjust the the level of suppor with more or less air. Once you have it inflated, the designed shape provides correct pelvic tilt for proper posture and comfortable meditation in lotus or burmese positions. One of the big bonuses with this cushion is it has a removable, washable cotton cover! This is great if you like to meditate outdoors while hiking or camping, because once you get home you can easily wash off dirt, sand, or grass stains. It zips off and can be hand or machine was. This cushion also comes with a drawstring carry bag for easy storage in your bag or suitcase. If you’re looking for simplicity when it comes to an inflatable meditation cushion, consider the Travel Zen. It only has one inflatable chamber, making it easier to inflate, and it comes in a comfortable cresent shape. Since it is inflatable, you can easily customize the firmness and the height of the pillow for the most comfortable meditation position. The manufacturer says this product is sturdy enough to support meditators up to 220 lbs (100 kilograms). Some of the reviews on this product are a bit mixed, with some customers finding that the cushion develops a leak after using a dozen or so times. This is an affordable option if you need something for a trip, but we wouldn’t recommend it for daily use. So this cushion is not designed for meditation, but it’s a great multiuse option for hikers and campers. This self-inflating outdoor cushion is advertised for using on hard stadium seats, but it’s great for on concrete or rocks. It’s also insulated, so the cold surface won’t chill you. It’s also a great option for meditating if you’re looking for a pillow or cushion in a rectangular shape, rather than the crescent shape offered by other brands. This inflatable pillows is super affordable and also self-inflates so you don’t have to worry about blowing it up. 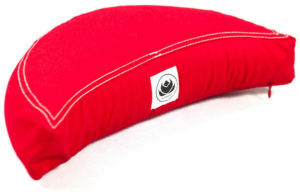 This cushion has a valve to adjust the firmness and it easily deflates and rolls up to store in a compact carry pouch. They are the perfect size for carry-on bags or backpackers. If you’re looking for a cushion that will work well for a kneeling meditation, this one is a good size to consider. It is smaller in width than the crescent inflatable cushions. If you want the firmness that an inflatable cushion can’t quite provide, the Zafu Travel Moon has a compact size to make it more portable than most zafu cushions. These travel meditation cushions are design with a moon shape that is slimmer than many zafus. The buckwheat hull filling provides the cushion and support you need for proper alignment and comfort during sitting meditation. It is not as compact for packing as the inflatable options, but it will easily fit in a carry-on bag or suitcase without adding too much extra weight. The design also includes a carry handle on the back of the cushion and a 100% cotton removable, machine washable cover. If you need a substantial and supportive cushion that’s easy to take on the go, this is your best bet. This may not be what you had in mind when you started researching travel meditation cushions, but you should consider it. If you’re looking for a portable cushion option that is also ergonomic, the Zen Comfort is perfect for you. Made from cushioning memory foam, the Zen Comfort is meant for more uses than just meditation, but it’s absolutely fantastic for chair or floor meditations.The ergonomic design helps support your bottom and legs for a perfectly aligned lotus or Burmese position, or even just sitting with comfortably crossed legs. While not the most compact cushion option, it easy to travel with you. You can carry it on a plane and then sit on it during the flight. It instantly turns an uncomfortable economy seat into a specialized ergonomic seat for a more comfortable flight. Even with a portable meditation cushion to aid your practice, you may still find many floors and other surfaces to hard to sit on comfortably. Zabutons are usually too bulky and tricky to pack, especially for flying or backpacking. Some people find travel yoga mats work well as a substitute, especially when folded up or rolled and placed strategically under the knees or feet. There are a few products on the market meant to address the challenge of a portable meditation mat. Some pair well with travel meditation cushions and one of our recommendations is its own set. This may just look like a yoga mat to you, but it was designed with a meditator in mind. It’s shorter in length than a standard yoga mat, meaning it saves on space and weight while providing a size that a meditator will appreciate. This is a dual surface mat, with a microfiber top and a non-slip cushioned bottom. While it has a good amount of cushion, it’s not going to be as comfortable as a fluffy zabuton. One of the big benefits of this mat is it keeps you off the ground or floor, especially if you’re meditating in public spaces. Comes with a carry strap for extra portability. You can roll it or fold it to store easily in your luggage or bag. It’s also machine washable. This pairs well with the Mobile Meditator inflatable cushion, creating a secure, non-slip combination. Watch out if you have a cat though, apparently they love to use it as a scratch pad, so keep it out of reach of your kitty. Dimensions: 26″ x 36″ x 3.5 mm thick, weighs 13 oz. If space isn’t at a premium for you when you travel, or you’re just looking for a zafu and zabuton set that’s portable enough to take with you to class or group meditations, then this is the set for you. (This is also a great option if you don’t have a lot of storage space at home). This full-size zafu and zabuton set features a folding zabuton cushion with carrying handles. Made from cotton canvas, these cushions are sturdy and beautiful. The zabuton is stuffed with kapok and the zafu features organic buckwheat hulls (and a zipper to adjust the firmness of the cushion by removing some of the filling). While this is not a great option for people who are flying, if you’re taking a road trip this set will easily fit in your trunk with your luggage. With most colors, you get an option of a round or crescent zafu pillow. Looking for more portable meditation supplies for travelers? Check out these folding and travel meditation benches and travel yoga mats.